a - Princes Highway between Ballina and Grafton, N.S.W; 6.2 x 9.2 cm; NOTE: Sight dimensions. b - Hobart, Tasmania; 4.8 x 4.4 cm; NOTE: Sight dimensions. c - Coogee, Sydney; 6.5 x 7.8 cm; NOTE: Sight dimensions. d - Dunedin, New Zealand; 8.6 x 10.9 cm; NOTE: Sight dimensions. e - Hume Highway between Gundagai & Yass, NSW; 6 x 8 cm; NOTE: Sight dimensions. f - Coogee Beach, Sydney; 6.5 x 8.7 cm; NOTE: Sight dimensions. g - Invention; 5.4 x 7.4 cm; NOTE: Sight dimensions. h - Princes Highway near Mullumbimby, NSW; 7 x 7.3 cm; NOTE: Sight dimensions. 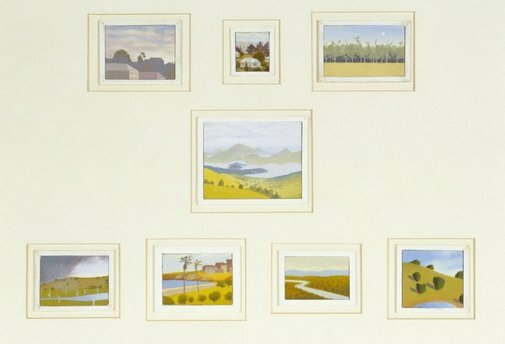 Patrick White, painter, manqué: paintings, painters and their influence on his writing , 'White and the Sydney Art World: 2', pg. 84-93, Carlton, 2002, 91, 146.